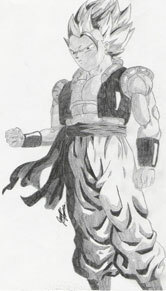 This drawing is of Gogeta from the anime series Dragonball Z. This is one of my first drawings with actual drawing pencils. I still prefer mechanical pencils.